1 How does Box affect my use of Google Drive? 2 What do the permissions mean? 3 How do I get my folders/files to be in alphabetical order? 4 How do I attach a file from Box to an email? 5 How do I save attachments in an email to Box? 6 How do I attach a file to an email in Gmail or from the Outlook app on MyBC? 7 When I try to attach a file to an email, I get a message saying “Do you want to upload (file name) to Box and insert a shared link?”. What does that mean? 8 How do I manage Box with my mobile devices? 9 How do I delete files and folders? 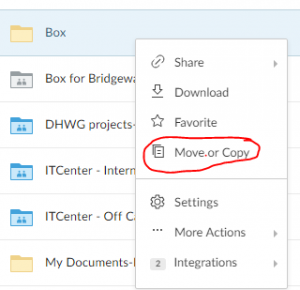 10 How do I move or copy folders or files? 11 How do I share a link to a file? 12 How do I get a file from Box to Moodle? 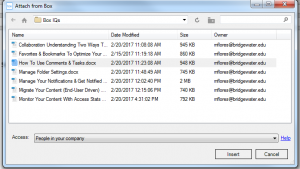 13 How do I recover a deleted folder or file? 14 I can’t find a file or folder. What can I do? 15 I use a folder or file frequently but it is buried down deep in my folders. How do I get to it quicker? 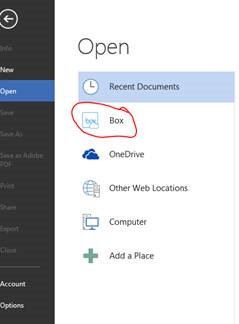 16 How do I open files from Box when using Microsoft Office programs such as Word and PowerPoint? 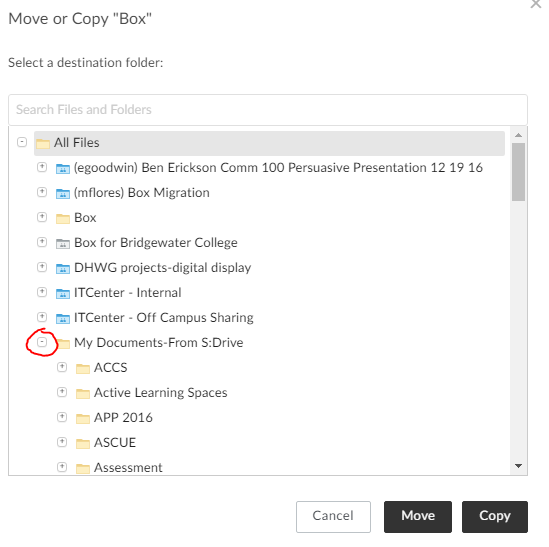 How does Box affect my use of Google Drive? You will still be able to have access to your Google Drive and any documents, folders, items stored in it. Your Google Drive will not be affected. What do the permissions mean? How do I get my folders/files to be in alphabetical order? Click on the tiny arrow next to “Name” at the top of the list of folders/files list to get your folders/files in alphabetical order. How do I attach a file from Box to an email? Click Attach from Box icon. The Attach from Box window will appear. People with the link means anyone with the link can preview and download the file. People in the folder means only the people that have access to the folder that contains the file will be able to see the file. Click “Insert.” Your link will automatically be created and inserted into the body of your message. How do I save attachments in an email to Box? The Save 1 Attachments window will open. How do I attach a file to an email in Gmail or from the Outlook app on MyBC? If you want to send a file from Box attached to an email in Gmail, you will have to get the shared link for the file from Box and copy and paste the link in your email. Click the Share button on any file or folder. A shared link to the folder you are currently in can be found under the Sharing tab of the right hand sidebar. Alternatively, you can right-click on a file (or click the ellipses (…)) to open the More Options menu, then click Share. When I try to attach a file to an email, I get a message saying “Do you want to upload (file name) to Box and insert a shared link?”. What does that mean? If you are attaching a file that isn’t from Box (such as a C:Temp folder), you will get this window. It is asking if you want to upload the file to Box and insert a link to the file from Box. To upload it to Box and share a link to the file, click Yes. If you don’t want to upload the file to Box, click No. Navigate to the folder where you would like to save the file. How do I manage Box with my mobile devices? 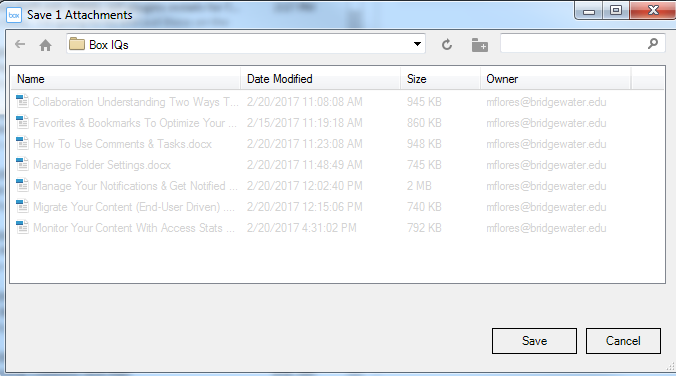 A pop-up window will appear asking you to confirm if you would like to delete the file or the folder. After you confirm the deletion, the item will be moved to the trash. How do I move or copy folders or files? Right mouse click on the folder or file you would like to move. 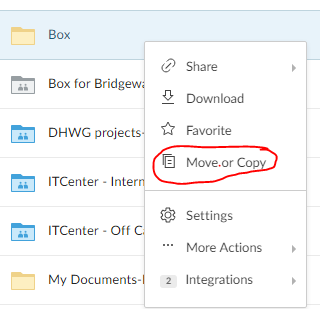 Select “Move or Copy” from the list of options. If you aren’t able to move your folder or file, please contact the Help Desk at help@bridgewater.edu. How do I share a link to a file? 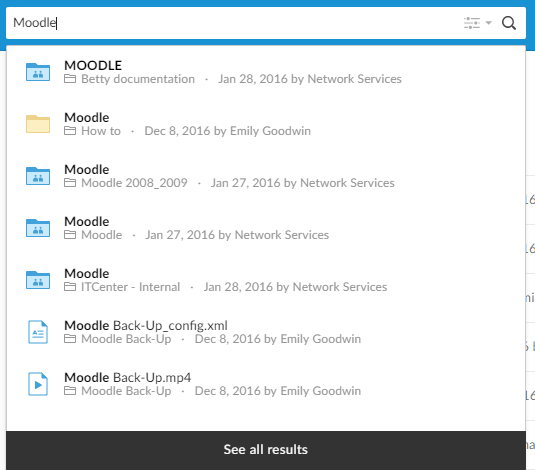 How do I get a file from Box to Moodle? 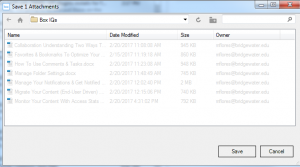 How do I recover a deleted folder or file? 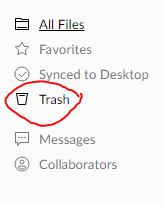 Click on “Trash” on the right side of the window. Select the folder or file you would like to recover. Click “Restore” in the upper right corner. I can’t find a file or folder. What can I do? Use the search box. 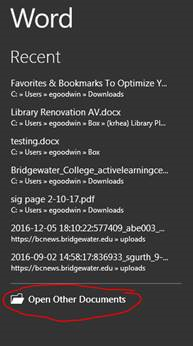 It will list all folders and files that contain the key word(s) you typed in the search box. I use a folder or file frequently but it is buried down deep in my folders. How do I get to it quicker? How do I open files from Box when using Microsoft Office programs such as Word and PowerPoint? 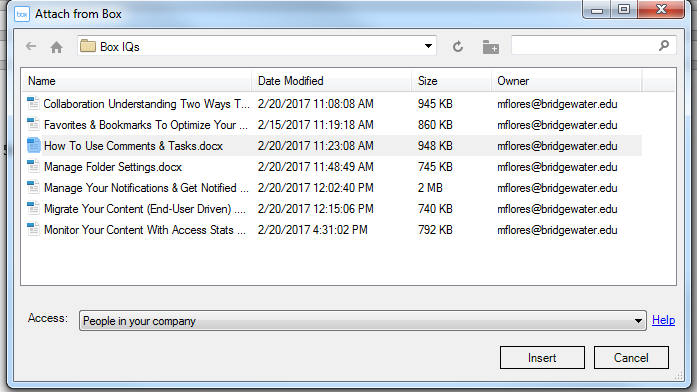 Open Word/Excel/PowerPoint and click on “Open Other Documents. Choose Box from the list of options. Sign in with Single Sign On-SSO. Navigate your files to the one you would like to open.